Kenmore White 600 Model #7965 Gas Flatback Dryer 5.9 cu. ft. 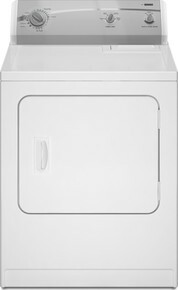 The Kenmore White 600 Gas Flatback Dryer (Model #7965) is a compact, 5.9 cu. feet dryer that is perfect for small spaces and middle-sized homes. Durability and ease of use are what comes to mind with this model, which comes in a smooth white finish. The Auto Moisture Sensing feature means that you no longer have to see if clothes are dry or not. The machine automatically turns off when no moisture is detected in the load. The compact frame makes this dryer perfect for small spaces. The classic white finish allows the unit to fit perfectly in any room. The 5.9 cu. ft. capacity makes it perfect for small- to middle-sized families. The wide-opening hamper door makes loading and unloading a breeze. The hamper door swings out for easy access. The 20-minute Touch Up cycle is a great feature for those who forget to unload the laundry. It tumble dries the load if it has been left in the machine for too long. Wrinkle Guard is another feature that prevents wrinkles by drying the load for 40 minutes without heat. Eleven cycles allow you to safely dry clothes according to settings provided for specific fabric types. Air fluff feature allows you to dry delicates without any heat. With up to 11 cycles, it means that the unit never gets too hot. Therefore, you avoid shrinking your clothes. Unlike other dryers, the unit itself does not get hot. There is little noise as well, which a lot of consumers love about this machine. Not only that, automatic moisture sensor prevents overusing the machine because it adjusts the drying cycle according to the moisture level present in the load. The flat-back design of the unit makes it easy to fit through doors. The size of this gas dryer makes it good for a medium-sized household but may not be good for anything larger because of its smaller capacity. One of the most common complaints about this dryer model is that problems start to show as early as a few weeks after purchase. Noise is the most common problem. In some cases, the rubber coating on the wheel can disintegrate after a few uses, which causes noise when the unit tumble-dries. Join in and write your own page! It's easy to do. How? Simply click here to return to Kenmore clothes dryers.